That's a steal! 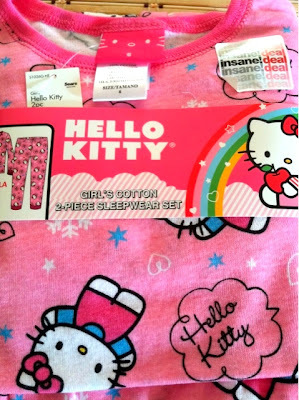 I can't wait for my daughter to like Hello Kitty. At her age, she's still super in love with Minnie Mouse and the rest of the gang. A great gift for any little girl. Nagdadalaga na si Akesh sis. Hello Kitty is my favorite cartoon character too! very cute mommy Dhemz! visiting your pink! heres mine..
what a steal! Hello Kitty is really a cute character for our little girls. what a deal and pretty pjs Mommy DHemz, am sure Akesha will love to wear her favorite cartoon character :-) Visiting from Pink Fridays. hope that you can return the visit too. What a great bargain, Mommy:) Could not blame her kay cute gydu si Hello Kitty..
oi, barato pa kesa kmart nga hello kitty pajamas nakit-an nako. cute yotch! cute tan-awn si akesha ani :) Sharing to you My Pink Fridays Entry.